Located in the elite part of the Vracar (municipality), Jellostone hostel is the right choice for Belgrade’s visitors who are looking for accommodation in a quiet and peaceful environment, in the one of the oldest parts of the city. This newly opened hostel offers comfortable and creatively designed space, privacy and a home feeling. Great location of Jellostone Belgrade hostel puts you in the center of all events, thanks to its large number of historical and cultural monuments, museums, universities, theaters, and entertainment venues. It is located only 50 meters from the oldest market, Kalenic. The city center and the main pedestrian zone are within 1.5 km from hostel, and the main railway and bus station can be reached in 20 minutes on foot. Hostel Jellostone is spread on one level and has the accommodation capacity of 16 beds. Structure of rooms are: double, two quadruple (2 bunk beds) and a six-bed (3 bunk beds). All rooms are comfortable, bright, equipped with heating, air conditioning and functional furniture. They have wide kitchen with common dinning room as well. Awesome thing is that their reception is opened 24/7. If you’re looking for a great place to stay in Belgrade and you want to feel the real vibe of this amazing city and people who live here, then Hostel Beogradjanka is the place where you want to be. Hostel Beogradjanka is located in the heart of Belgrade, in one of the oldest and most beautiful neighborhoods – Vracar. The hostel stretch trough 160m2. It is located in the apartment building which was built in early XIX century and for this reason the elegance, spaciousness and comfort of this hostel will make you feel like you are back in the good old times. It counts 18 beds which are in 4 big spacious rooms, privates and dorms. The rooms are air-conditioned, and equipped with free lockers and free hairdryers, towels and bed linen are also included. 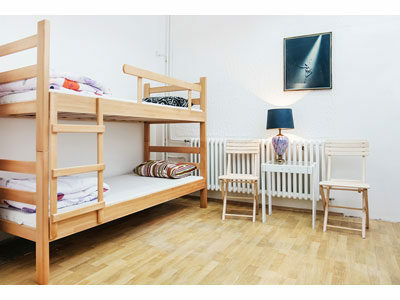 Beogradjanka Hostel runs a 24-hour front desk and offers free Wi-Fi in the hole hostel. The big living room is very cozy and a great place to hang out and meet new people. The guests also have access to a fully-equipped kitchen with a dining area and a lovely big terrace. Friendly staff will do their best to make your stay in Belgrade an even better experience and they will direct you to the best local places in town. This hostel is also located in municipality of Vracar, in Belgrade. Located in a very quiet part of town, this hostel is the perfect choice for those who prefer peace and silence. Still, this amazing place is a walking distance to everything you need. Near hostel there is a museum of Nikola Tesla and Spanish embassy, as well as many other attractions of Belgrade. What we especially want to highlight is the proximity of the most beautiful park in Belgrade, Tasmajdan park, in which greenery you can enjoy during the day. Rooms have Air Cons and Hostel provides Wi-Fi internet access. Modern equipped hostel in the center of town will provide you with comfort and convenience you are accustomed to in your home. Each guest receives a special locker for storing their belongings. During your stay in hostel you can use the living room with a big TV, fully equipped kitchen with all the accompanying elements, as well as spacious terrace from which you can enjoy the beautiful view. Also they offer breakfast service, in the restaurant which is located 50 meters from the hostel. Within 150 meters from the hostel “El Dorado” is a large number of cafes and shops where you can find everything you need during your stay. Bus and railway stations can be found at about 1.8k from the hostel, and airport Nikola Tesla is about 17 km from the hostel. 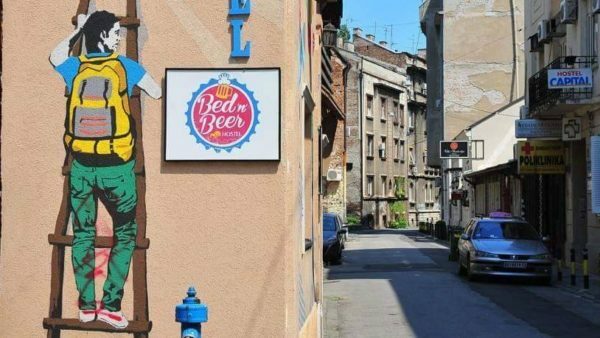 Bed ‘n’ Beer is a great hostel in the heart of Belgrade. The hostel is located near Skadarska Street, just a few minutes by foot from the city center (Terazije and Knez Mihailova Street). It is near to many shops, cafes, restaurants and night clubs. It has cozy rooms with different price ranges – from dormitory rooms with cheap bad rates to more expensive single rooms. All rooms are spacious, air conditioned and extremely clean. The best thing about this hostel is that it has its own pub, so you get to party all night without leaving the facility. Guests often gather there, especially on a rainy weather. They get a chance to meet and chat and share their travel stories. Kind staff will make your visit one of a kind experience. They are available for all questions about staying in Belgrade and making the best out of visiting Serbia’s capital. You can check the list of the 5 stars hotels in Belgrade as well!